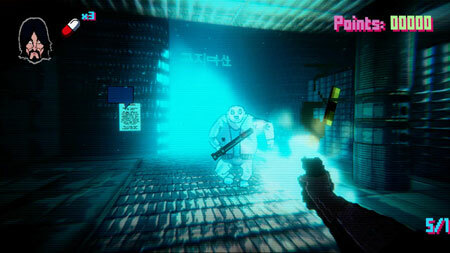 Project Downfall is a trippy, reflex based shooter with adventure elements. You start in your apartment after another routine day at the office and your adventure starts from there. The storyline will progress with completion of main missions. Descend down the rabbit hole and embrace your Downfall in a trippy, brutal and stylized adventure. You are a regular, middle class citizen. By day, leading your ordinary, rinse-repeat corpo-routine life, with your lovely girlfriend Olga by your side, a well paid job and crib with an amazing view. By night however, you give your contribution to society as a self-proclaimed dealer of justice, dispatching all sorts of scum with extreme prejudice. Main missions will be accessed from your car outside the apartment. If you get stuck in the game, check out the video walkthrough and gameplay for the game. This entry was posted in PC Games, Walkthrough and tagged Project Downfall Cheats, Project Downfall Gameplay, Project Downfall Guide, Project Downfall Walkthrough by Marvin. Bookmark the permalink.